Pistons forged Wiseco para Alfa romeo 33 1700cc 16V, engine code AR3055. -Diameter of the pin: 21mm. -Diameter of piston: 87mm, 87,5mm, 88mm. Delivery time may vary depending on stock, please inquire. Wiseco is a world leader in the manufacture of forged pistons. They manufacture their own forging tools and all their forged pistons in the USA to give exceptional quality in their products. Wiseco stands out in its machining and finishing, as for example the rounding of all the edges that can create hot spots and auto ignition at high loads and pressures in the head of the piston. Wiseco pistons have valve recesses in the piston head where necessary. Extreme race conditions demand strength and hardness that only the forged pistons can offer. Compared to parts castings, forged parts are stronger and more durable, and will withstand the abuse that high performance motor sports applications require. Most castings are fragile and tend to fail catastrophically when the elastic limit of the material is exceeded. Forged parts have superior mechanical properties and resistance to impact and fatigue. Wiseco Forged Pistons offer a new skirt coating called ArmorGlide ™, which is the result of testing and development through rigorous test bench programs in the Wiseco lab. The result is the ultimate in skirt lining, lubrication, and technology. Everything works together to minimize friction, maximize power, and provide better wear resistance. Not only is it a high-tech lubricant that reduces friction, it also allows the piston to fit more tightly inside the liner, allowing better segment sealing and noise reduction. 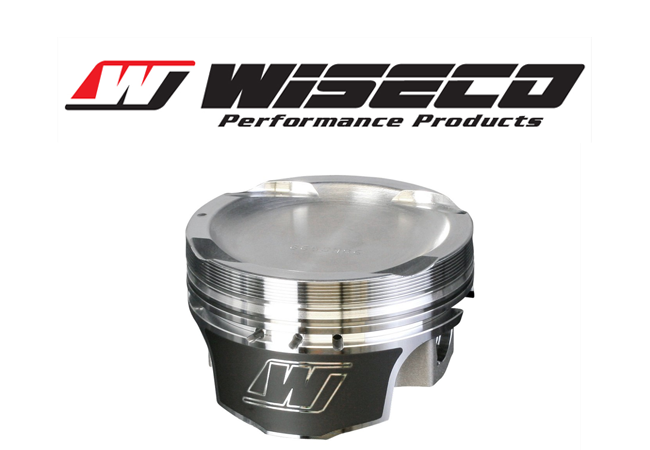 Wiseco ArmorPlating is applied on some RC series and sport series compact pistons. This high performance coating is applied to the piston crown, segment grooves and the piston pin hole, these parts are darker to the naked eye by the coating. The cladding of the dome helps to protect the piston from damage caused by detonation, and actually hardens over time from the heat caused by the combustion. This coating also applies to the segment groove and helps eliminate micro-soldering from the segment, reducing groove wear and improving sealing. The liner in the piston pin hole reduces wear and friction.